Details of the much awaited 8th generation Intel HQ-series CPUs have surfaced online and from the looks of it, seems to corroborate our expectations of a 'Coffee Lake' 6-core 45W chip. 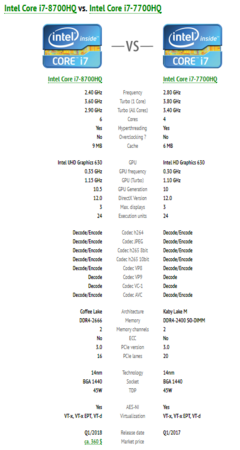 The rest of the specifications are more or less similar to that of the extant 'Kaby Lake' quad-core 45W HQ offerings. Looks like we have started to get some details about the much awaited Intel 'Coffee Lake' 6-core 45W chips. A listing at CPU Monkey shows specifications of a pre-production sample of an Intel Core i7-8700HQ CPU. The specifications show that the new 8th generation 'Coffee Lake' CPU will be a hyperthreaded hexa-core chip with 2.4 GHz base and 3.6 GHz turbo frequencies and, a 9 MB cache. The onboard GPU is the Intel UHD Graphics 630 and is the same as that of the predecessor 'Kaby Lake' version barring some slightly higher clocks. The CPU supports DD4-2666 RAM compared to the DDR4-2400 RAM in the last generation but comes with lesser number of PCIe lanes at 16. The TDP is rated at 45W and the CPU is fabricated on the 14nm process. There have been many hints suggesting the arrival of hexa-core 'Coffee Lake' chips sometime around Q1 2018. A Geekbench score surfaced in late August from a mysterious hexa-core CPU with similar specs as above showed single-core scores on par with the 7th gen 'Kaby Lake' and a 40% performance boost with all 6 cores activated. MSI was one of the first to acknowledge the existence of the Core i7-8700HQ with the launch of the Vortex G25 mini PC, back in late September. We also reported that Dell was waiting for Intel to ship new 8th generation 45W chips to power the upcoming XPS 15. CPU Monkey also lists pricing information at about $360, although, it is likely to be incorrect given that the CPU hasn't officially launched yet. Earlier this month, a leaked roadmap pointed towards 'Coffee Lake' quad-core and dual-core 35W CPUs coming sometime in Q1 2018. Although we are yet to see any specific leaks with respect to the 35W chips, considering CES 2018 is not too far away, we will surely begin to see more information trickle down.